On behalf of Dave Manes DBA Skyline Roofing I am submitting this positive letter of recommendation. While serving as Director of Public Properties for the City of Beatrice, Nebraska for thirty years and as a past Gage County Supervisor I have had the opportunity to work with Mr. Manes on roof replacement and roof repairs on both our city and county buildings. He has been a helpful advisor for assisting us with the bid specifications regardless of award outcome. His annual follow-ups on all of his projects and his factory backed warranties are unparallel to any other roofing contractor that I have worked with. I would highly recommend Dave Manes DBA Skyline Roofing for any of your roofing projects. The Board of Commissioners of the County of Nemaha, Nebraska has been asked to write a letter of recommendation for Dave Manes, Skyline Construction. Dave has been the contractor for 2 major roof replacements on buildings owned by Nemaha County. The County Courthouse was reroofed with slate shingles and the County Multi-Plex building was reroofed with a Dura Last Membrane. We have been very pleased with the work done by Dave Manes and his company. The courthouse roof has had damage from several storms in the past several years, and Dave has been very prompt in returning our calls and repairing the roof. The Board of Commissioners of the County of Nemaha, Nebraska highly recommend Dave Manes, Skyline Construction. In 2007 your company replaced our sheriff's office roof. Two other companies had replaced portions without any real success as their replacements leaked. As of this date our roof is leak free. You did an excellent job on an almost flat roof. Please use this letter as a letter of recommendation. Please consider this letter a letter of recommendation for Skyline Construction, Inc. and Dave Manes. Skyline Construction, Inc. provided and installed a Duralast roof system, on Densdeck on a commercial remodel project for my firm in Parachute, CO in Fall 2008. The size of this project was 12,500 square feet and was installed over an existing R-panel steel roofing system circa 1980. The project was completed in 3 days and has not had any warranty call-back issues since the installation. The work was completed quickly and professionally and was inspected by Duralast after the installation with no negative comments. My firm highly recommends Skyline Construction, Inc. for your project. Please contact me with any further questions that you may have at the numbers above. 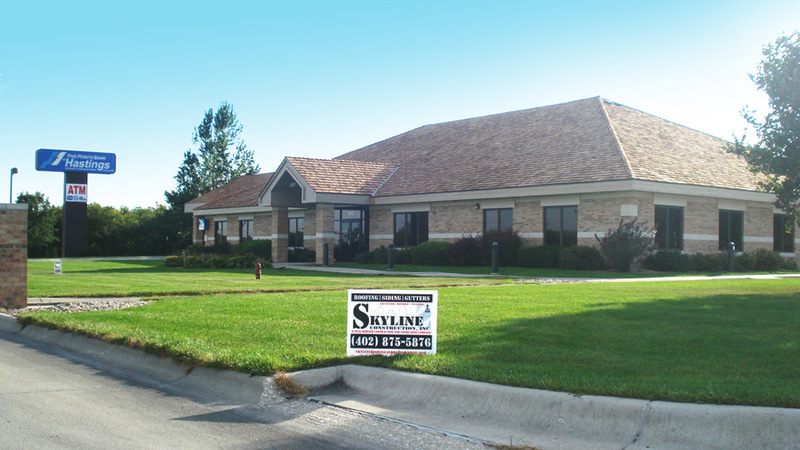 We recently used the services of Skyline Construction, Inc. for a large re-roofing project at our Ambassador Nebraska City nursing home. I would recommend the company as their work was done timely, with care and precision, and they were mindful to leave the premises in clean order at all times. If you would like to visit with me further regarding our experience with Skyline Construction, I can be reached at (402) 873-8524.